The land has been cleared and the builders have now moved on site, ready to start building our new 'home away from home' to ensure that over 400 families that we turned away last year have a safe and comfortable place to stay while their seriously ill child is being treated at The Children's Hospital Westmead. 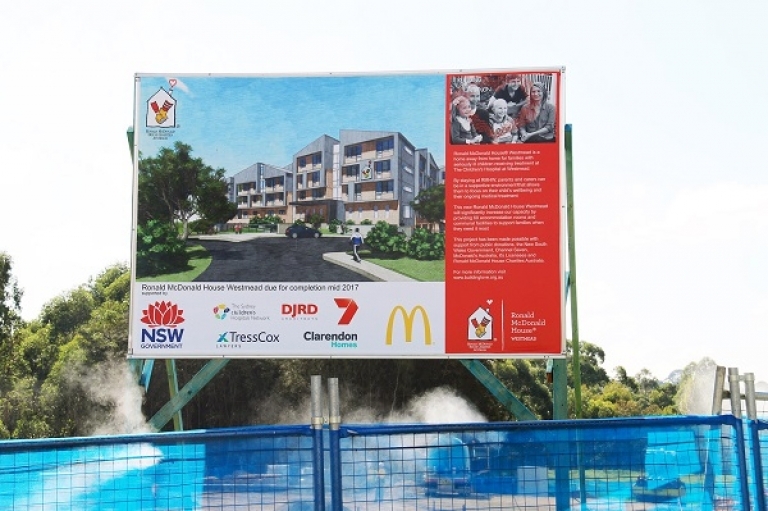 Mike Thomas, Ronald McDonald House Westmead Executive Officer, said research has shown that there are better outcomes for our seriously ill young patients and their families when they are together and the new House will provide this home, support and one less worry during difficult times. "We are incredibly excited to see site preparation underway following years of planning and support from both the NSW Government and the corporate sector," Mr Thomas said. "Spearheaded by the NSW Government, Ronald McDonald House Charities Australia, Channel Seven and numerous corporate and community supporters, we are working towards our target of $33 million, but we still aren't there yet"
"We still need everyone's help to reach our goal - we need another $8m to ensure that this home is completed by the end of 2017"
"This really has been a dream in the making and with the initial construction just about to begin it can't come soon enough." For more information on how you can build the love, click on the donate icon. Every dollar you donate makes a real difference in the lives of seriously ill children and their families.